These glasses are made entirely from recycled glass and sea stones gathered from New England shores. Organic and unexpected, these contemporary glasses are made entirely from recycled glass and sea stones hand gathered in New England. 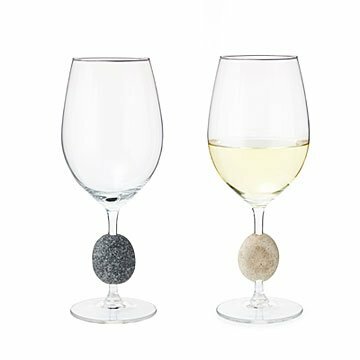 Smooth, heavy and naturally comfortable in the hand, each unique stone will also help guests remember which glass is theirs. For every stone harvested, a rough quarry stone is "planted" in its place. Handmade by Arra David and Anne Johnson in New Hampshire. Each is one of a kind and will vary. Originally, the glasses were not well packed and one was broken. After I notified the company, they changed the way they packaged them and came through postage unscathed. They feel comfortable and secure to hold, especially if you have arthritis. Their uniqueness means you always know which glass is yours. They are not delicate glass and quite thick but they are very attractive. Just don't let your husband wash one, he broke it.. I love the way the glass felt in my hands. My husband broke a glass while cleaning it so I suggest a more delicate touch. I have the other glass left which is "hands-off" to my husband. Love the way this glass feels in my hand! My friend from back in Virginia Beach first sent me a pair of these from a specialty shop. One of the glasses broke in shipment. I loved the one that survived so I searched online to see if I could find a replacement. I found them and finally replaced 2 more pairs. They came in the mail from the artist in perfect shape. I had expected one dark and one white but received two dark, one white and a grey speckled one. I've used mine out in company and they've commented how great a glass it is. Now I can share mine with others. I just love the way these wine glasses feel in your hand. The rock fits your hand so nicely and because it's stone it stays cool. Just a nice feeling! These glasses are our always a topic of conversation, bought them for my lake house. They are very fragile and 3 have been broken easily. I bought these as replacements because they are so cool. Had a male friend say they are very easy to hold for bigger hands. I had 4 and was washing one and it slipped out of my hand and so I had to buy 2 more. Couldn't buy just 2, but that's okay. Ended up buying 4 for my Son & his wife for Christmas as they just moved to the beach in CA. I own 10 of these glasses, and have given them as wedding gifts in several occasions. The recipients always are blown away by the individual pieces. They arrived beautifully, I reshipped them to England in the same packaging, and they arrived there beautifully. I highly recommend these wome glasses if you are looking for a gift....even one for yourself.